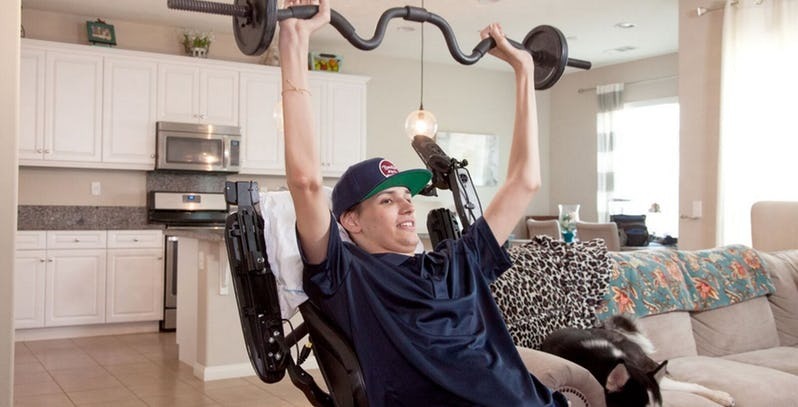 An experimental new therapy involving stem cells has helped a man paralyzed from the neck down regain control of his arms and hands. Back in March, Kris Boeosen was driving home when he lost control of his vehicle. He spun off into a ditch, hitting both a lamp post and a tree along the way. The crash left him paralyzed from the neck down. This is the part where doctors would normally come into the room and deliver the bad news, that Kris would never walk, hold his cell phone, or even feed himself again.. However, this time doctors offered him an alternative: an experimental stem cell therapy that had the potential to repair the damage to his spine and allow him to walk again. In April, Kris made his way down to the University of Southern California’s Keck Hospital to receive an injection of 10 million AST-OPC1 cells directly into his cervical spinal cord. Within 2 weeks, Kris had regained feeling in his hands. Three months later and Kris could use his phone, write his name, feed himself, and had no trouble operating his motorized wheelchair all on his own. Kris is continuing his physiotherapy where he hopes to one day regain the use of his legs and maybe even walk again. Doctors will reassess his condition every thirty days up to one year in order to determine the efficacy of the treatment, but so far the results are very promising. This particular study is being performed in 6 different hospitals across the United States. It’s currently in Phase 1/2a clinical trials, with the results to be posted this September. So far, 100% of participants have regained some use of otherwise paralyzed limbs, and so long as nobody suffers a horrific side effect like growing a third arm, then the trial is expected to continue to Phase 2 where it can be rolled out at additional hospitals across the country.